In low-temperature applications, using piston machine for vapor compression in one " squash " from low suction pressure up condensing pressure is ineffective. This is because the compressed gas left in the amount of clearance at the end of the compression stroke would redeploy on the way down, and leave little room for drawing in more suction gas for the next turn. In addition, compression wider differential pressure may cause excessive discharge temperature. For these reasons, compressor manufacturers set restrictions on the operation for one step of the operation, which refrigerant dependent (usually about 10:1). For low-temperature applications, compression must be carried out in two stages. 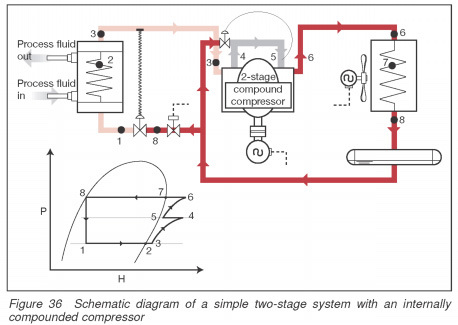 In the period between the two stages of compression, it is necessary to cool the gas-refrigerant to avoid compressor failure. On small systems, this can be done through the introduction of liquid refrigerant leaving capacitor directly to the refrigerator between stages. The alternative is to use cooling, which provides cooling of inter-phase gas using a pool of refrigerant in the intermediate pressure and temperature. above refrigeration temperature can be served with intercooling and, consequently, high-stage compressor only reducing the load on the small stage of machines. There are two types intercooler. The simplest type intercooler-outdoor pressure vessel (i.e..
the liquid refrigerant flows through two expansion valves to achieve the evaporator, both size for the whole stream of the refrigerant. superheated gas from the first stage of compression is passed through the pool of liquid cooling (i.e. de-overheating) before the entry into higher stage cylinders. Closed type intercooler less sensitive to changes in load, than open-type unit. The liquid passes through only one expansion valve, thus most of the difference in pressure between condenser and evaporator, is available through the evaporator expansion valve. In the open box, type it extends twice; first of all, from condensing pressure to intermediate pressure, and, finally, from the intermediate pressure for evaporating pressure. Closed-type device, supercooled liquids, usually within 5C interim saturation temperature. Liquid leaves the shell side of the open type intercooler, rich, at a temperature equal to intermediate saturation temperature. The two most common types of two-stage (or complex) systems are shown in Fig. 36 and 37. This basic system (Fig. 36) only solves the problem of high-temperature vapor with minimal capital expenses. The minimum level of the condensing pressure must be maintained. Inter-stage pressure may not be the most effective for the particular application. The system in Fig. 37 provides improve energy efficiency primarily supercooling of the liquid is evaporated apparatus, usually within 5C interstage saturation temperature. In addition, this system provides full de-overheating of the low discharge stage. This allows lateral loads (i.e., higher temperature, pressure) at all scales to be supplied to the intercooler, temperature, or allows optimal intermediate stages that will be used. Capital expenditures, however, are relatively high..